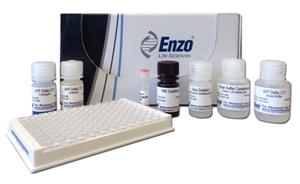 Figure: APP &Delta;C31 ELISA kit from Enzo Life Sciences, Inc.
Further establishing its position as an innovator in tools for detection of neurodegenerative diseases, Enzo offers a high sensitivity APP ΔC31 ELISA Kit; a one-of-a-kind quantitative ELISA for Alzheimer’s research. Unlike the more familiar β-amyloid and tau fibrillar pathway leading to amyloid plaques and tangles, APP ΔC31 reveals an alternative, unique pro-apoptotic mechanism leading to Alzheimer’s disease. APP ΔC31 is the stable amyloid precursor protein fragment created from a caspase cleavage event of the APP695 molecule at Asp664 leaving a smaller 31-residue intracellular fragment. Both the APP ΔC31 and 31-residue fragments are pro-apoptotic and are present in 4-fold greater levels in Alzheimer’s disease patients [Bredesen D.E., et al. (2006) Nature, 443: 796-802]. Given that the smaller 31-residue fragment has a short half-life and is difficult to measure, the use of this APP ΔC31 ELISA provides for the first time a sensitive research and clinical tool to measure the levels of the APP caspase cleavage from tissue, biological fluids and cells. This ELISA kit enables sensitive identification and quantification of APP ΔC31, detecting as little as 0.92 pM of APP ΔC31 in human cell lysate and cerebral spinal fluid samples. The assay provides quantitative results with excellent reproducibility between experiments, offers greater efficiency over Western blotting by requiring less sample input, and provides analysis of up to 38 duplicate samples in just 2 hours. The ELISA displays high specificity to human APP ΔC31 with low cross reactivity to other APP isoforms. The assay was developed in collaboration with the Buck Institute for Research on Aging and with the support of a grant from the NIA (grant # AG041456). Researchers at the Buck Institute have validated use of the assay in drug screening applications for caspase inducers and caspase inhibitors. Like all Enzo Life Sciences ELISA kits, the APP ΔC31 ELISA kit is complete, flexible, and put through rigorous fit-for-purpose validation and stability testing to ensure high precision, accuracy, sensitivity, and specificity. It is supplied with an easy-to-follow protocol, pre-coated microtiter plate, and color-coded liquid reagents to save time and reduce errors. The 96-well break-apart strip plate design provides throughput flexibility to minimize waste. The APP ΔC31 ELISA kit is the most recent addition to Enzo’s industry-leading portfolio of products for neurodegenerative disease, including products for detection of Tau protein, &beta:-amyloid and 24(S) Hydroxycholesterol. For more information or to order the APP ΔC31 ELISA kit or other Enzo Life Sciences products, please visit us at www.enzolifesciences.com or call us at 1-800-942-0430.